1st floor apartment of a Provencal farmhouse has chateaurenard, an entrance, a superb kitchen fully equipped with dishwasher, dining room 50m2 exposed beams, Lounge Sofa 3 seater 2 Armchair Leather, 2 bedrooms, bathroom with toilet, pantry with washing machine tumble dryer, superb, 25m2 terrace overlooking the garden and pool 1500m2 fenced 12m50 x 5 permanent .ensoleillement, parking. Garage for car or Motorcycle. Pool house pool, chaise lounge. 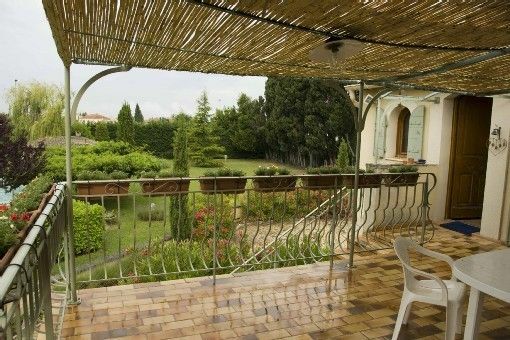 1500m2 garden with children playground, parking, boules, barbecue possibility 12,50x5 Pool Closed, relax garden, terrace overlooking the garden with table .MA Wash and dryer, Laundry, ironing board, etc. We enjoyed out stay very much, the flat is very spacious, well furnished and well equipped. The owners are very friendly and very helpful, lots of nice touches. Would definitely stay here again! To respond belatedly to your kind appreciation. On your stay in our Gite. It was a pleasure to receive you in Provence. And we hope to see you again for a new holiday. Wishing you a good holiday at the end of the year. The apartment had everything we needed, a cosy fully appointed kitchen,a relaxing lounge with easy chairs and comfortable bedrooms. The hosts were helpful in orienting us to Chateaurenard and the surrounding area. We also enjoyed sitting on the terrasse overlooking the beautiful garden. All Our apologies for such a late night. We were very happy to accelerate you in Provence. Hoping to have the pleasure of seeing you again. For the end of Année, coming. The accommodation exceeded our expectation, the facility is gorgeous and perfect for a family stay. we will definitely recommend this location to our friends. Joseph and Helene are excellent Gite owner's and really take care of their customers, the location is perfect to visit every location in the area. Bonjour Daniel et Famille . Merci beaucoup pour votre tres aimable commentaire sur notre gîte et sur sa situation géographique au coeur de la Provence . We enjoyed our stay at Joseph and Helene's gite very much. The accommodation exceeded our expectation. Our hosts provided fresh vegitables from their greenhouse daily. Very sociable and caring hosts. We had a lovely wine and cheeze gathering with the hosts and other guests in the garden. We had a car and visited Avignon,Arles, Nimes, Gordes, Pont du Gard, St Remy. Very Nice!!! Hello Sandy and James . Bonjour et quel plaisir de vous lire ,et merci pour votre délicate appréciation.c'est un grand plaisir pour nous de rencontrer des personnes nouvelles et de pays différend ..
Mais vous les Canadiens il y a un plus ? aller savoir pourquoi mais ces comme cela. .
nous sommes heureux de lire que votre séjour a été agréable ,et que le Gite et son équipement a dépassé vos attentes ,,c'est gentil ,mais normal ,nous tenons avec Hélène , que les vacanciers quand ils arrivent a la maison ne pensent qu'a leurs vacances et du plaisir a visiter et apprécié notre belle Provence . Le jardin et la serre sont prêt a recevoir les plantations pour l'été prochain ..
Grand merci pour tout, d'avoir fait votre connaissance ,,avec cette gentillesse qui vous caractérise ,et cette bonne humeur et accent magnifique. Nous espérons avoir le grand plaisir de vous revoir en Provence ou au Canada ..
Amitiés a tous les quatre. Thanks,for your kindness, you gréat summers ,With all our friendships. As mentioned in the previous reviews, the location was excellent, calm, like in countryside, but still all the services easilly available, some even within walking distance. Hélène and Joseph were wonderful hosts. House is very well equiped, area is safe and peaceful and fits extremely well to families with children. Kichen was beautiful and functional and it has direct access to the terrace. We really enjoyed our holiday in this place. C'est avec grand plaisir ,que nous avons prie connaissance ,avec Hélène ,de votre aimable appréciation ,sur notre gite ,notre plaisir a été grand ,de vous recevoir en Provence ,malgré la difficulté de la langue ,nous avons put ,partager d'agréable moment ,avec les enfants . nous vous souhaitons un bel été dans votre beau pays ,est nous espérons avoir de vos nouvelles par le net.un museau ,de Belle a votre délicieuse fille . Merci ,de votre amabilité . We thoroughly enjoyed our one week stay in this beautiful, spacious, immaculately clean and well-equipped apartment. The cottage is walking distance to a grocery and the public market held on Sundays. It is perfectly central, making it easy to drive to Avignon, St-Remy, Les Baux, Luberon, Pont du Gard and more. We would highly recommend this 'mas' to friends and family. Thank you very much, Joseph and Helene, for giving us a warm welcome and for helping us have an authentic Provencal experience. 500m from shops, 15 minutes on foot from downtown .Avignon, TGV station, airport, highway 15 minutes.Saint Rémy de Provence, the 15km leases, Arles, Vaucluse fountain, Pont du Gard, the Luberon Gordes Uzés within 40 km, St. Mary of the Sea, Marseille 1hour. 25 pour cent a la réservation ; Le solde a la prise de possession de l'Appartement Prise possession de l'Appartement a 16heures ,Départ a 10 heures . Location Weekend a 250 Eur Comprend la nuit du Vendredi et Samedi .